Shuffle Along (1921) and Blackbirds of 1928 (1928) are both pioneering “black musicals,” though they have little in common except their all-black casts, a leading lady (Adelaide Hall), and the fact that both enjoyed game-changing success in their original Broadway productions at opposite ends of the Jazz Age. Shuffle Along opened May 23, 1921, ran for 484 performances and toured for years; it is recognized as the first significant Broadway book musical written by African-Americans – composer Eubie Blake, lyricist Noble Sissle and librettists Flournoy Miller and Aubrey Lyles. Blackbirds of 1928 opened almost seven years later (May 9, 1928), the inspiration of a white creative team led by impresario Lew Leslie. Leslie hired two young songwriters (composer Jimmy McHugh and lyricist Dorothy Fields, fresh from their first success writing for the Cotton Club in Harlem) to create a revue to showcase an all-black cast. Blackbirds of 1928 ran for a remarkable 518 performances, making it for many years to come the longest-running all-black show in Broadway history. But Broadway musicals began a steady evolution in the late 1920s, a process that quickly turned the quaint screwball silliness of Shuffle Along and the super-slick Blackbirds of 1928 into theatrical relics. Shuffle Along was revived without success in 1933 and 1952. Leslie mounted three subsequent editions of the Blackbirds franchise in 1930, 1933 and 1939, none of which achieved the success of the 1928 show, though it is interesting to note that Lew Leslie’s Blackbirds (1930) featured the participation of Eubie Blake and Flournoy Miller. What has endured are the songs both shows introduced – most notably, “I’m Just Wild About Harry” from Shuffle Along and “I Can’t Give You Anything but Love” from Blackbirds of 1928. 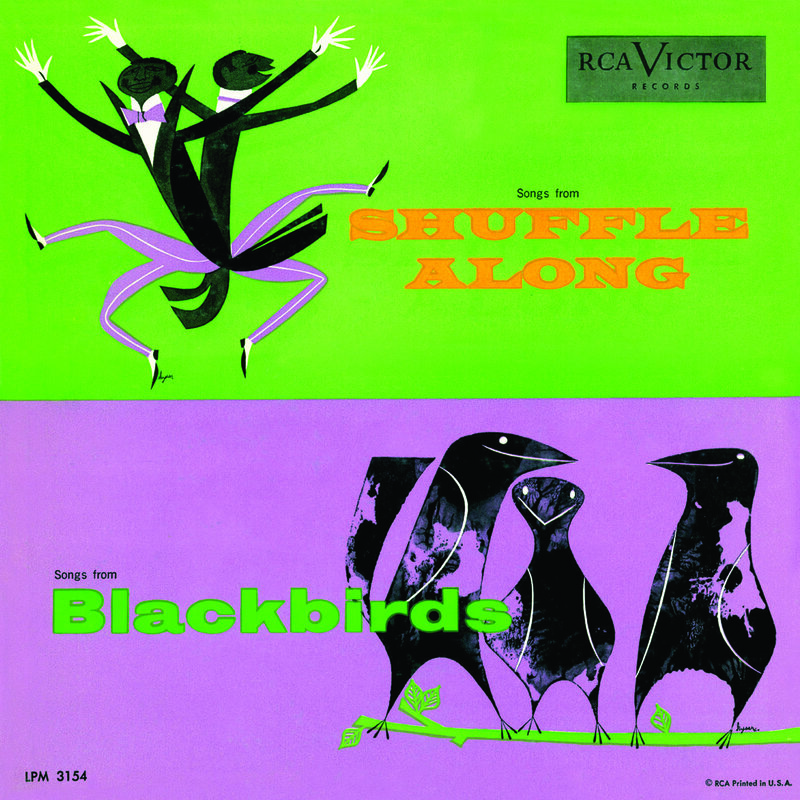 Inspired by Eubie Blake’s attempt to revive Shuffle Along in 1952, RCA Victor made a recording of four songs from the score for its “Show Time” series of 10-inch LPs, featuring new studio recordings of great songs from Broadway’s past. Blake conducted the recording and played the piano (as he had in 1921); band singer Thelma Carpenter and Avon Long (a noted Sportin’ Life in Porgy and Bess), who starred in the short-lived revival, share the solos. Also in the “Show Time” series, four songs from Blackbirds of 1928 were recorded the same year, with Carpenter joined this time by Cab Calloway and Lehman Engel conducting. Shortly thereafter, the two 10-inch LPs were coupled for reissue on a single disc, as they appear here. Sadly, these are the most complete single recordings of either score, though individual sides were recorded and released (out of context, as pop records) in the 1920s by original cast members. What these brief recordings captured before it was too late is something of the original style and exuberance that made these two shows part of the Broadway zeitgeist of the 1920s. Shuffle Along and Blackbirds of 1928 themselves may be hopelessly dated theater, but the songs they introduced are timeless and unforgettable – representing nothing less than new voices and new sounds that would shape the destiny of that mainstay of modern American culture, the popular song.